Amusing reportage from New York Magazine about a bike ride the Danish Prime Minister took in New York's Central Park the other day. 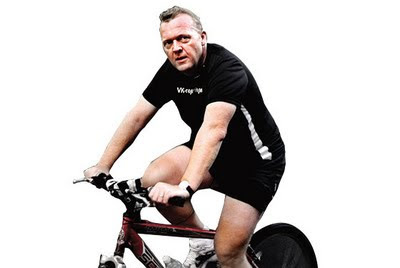 Not exactly a svelte man, Lars Løkke Rasmussen does try to participate in various cycle sport activities, which is lovely. This new prime minister, it must be said, is the kind of guy you'd like to have a beer with, even though he is not in a party I would personally vote for. Too far right for my liking. Nevertheless, a political commentator in Denmark shrewdly pointed out that it was odd that he strangely avoided being ridiculed for squeezing his round tummy into a lycra outfit when a former prime minister was ridiculed and, in effect, felled as leader of the country because he wore a bike helmet some years ago. I just think it's great that the man went for a bike ride. Just like Obama did. Everything else is completely irrelevant.